Water heating appliances are the necessary ones during winters that do a lot more for your hot water-related needs. Whether to get a bath in the chilly winters or for other household chores like washing clothes and utensils, etc. water heating appliances play an important role. 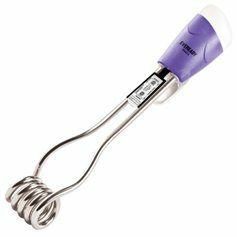 There are a lot of appliances are available for the purpose heating water, and Immersion Rods are the very economical one. Heating water on stoves, installing geysers, and using green solutions like solar water heaters are some of the common ways to get hot water. But using the immersion rods to get hot water in the chilly winters is one of the best and inexpensive methods than the other ones. So, if you are on a tight budget, just go for the immersion rods to get fulfilled all your hot water-related needs. 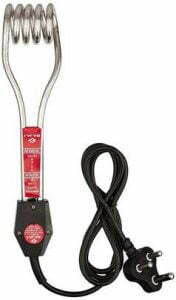 Immersion rods or immersion water heaters are extremely useful and a convenient way for heating water. It is the very simple appliance which can be used to heat up a bucket full of water in just 15-20 minutes. Immersion rods come with a heating coil and also have a cord which is plugged into the electric socket. To get hot water using an immersion rod just put the rod into a bucket full of water and then connect the plug into the socket and switch it on. It will take only 10-15 minutes and then you can enjoy ready to use hot water. Immersion rods are the very economical way to get hot water in few minutes only. This option is best for small families, bachelors, and the people who can’t afford the water geysers. Also, immersion rods are the portable devices as well. Unlike geysers, you can easily make it move from one place to another. Now it’s the time to get the full reviews on best immersion rods in India for 2018 that we have rounded up here. All these are the latest and best models of immersion rods all with the economical price. So you can easily pick the one and get rid of doing all your household chores with the chilled water in winters. If you want quick and instant hot water at a cheap price and also with great efficiency, this immersion rod from Bajaj is the best option to buy. Being compact in size, this immersion rod can easily be accommodated in cabinets or other storing places. The best part about Bajaj products is that they come with the best power usage and even at low price tags. This Bajaj immersion rod is the classy example of the same. It consumes only 1500 Watts of power and heats water very quickly, and thus proving to be the energy-efficient. It is designed with hairpin tubular elements that facilitate optimum heat transfer for the enhanced performance. 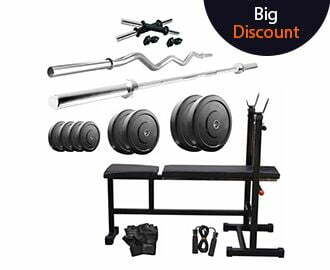 Also, it is made from anti-corrosive plastic material and copper with nickel plating ensuring its durability and efficiently functional for long. Heating water using an immersion rod is easy but getting it balanced so that it does not dip beyond the maximum level is somehow difficult. Get rid of this problem by bringing this immersion rod from Usha. It comes with a hook on one side that allows you to clip the immersion rod to the side of the bucket. And the opposite side has a water level indicator to dip the rod exactly at the maximum marked point. 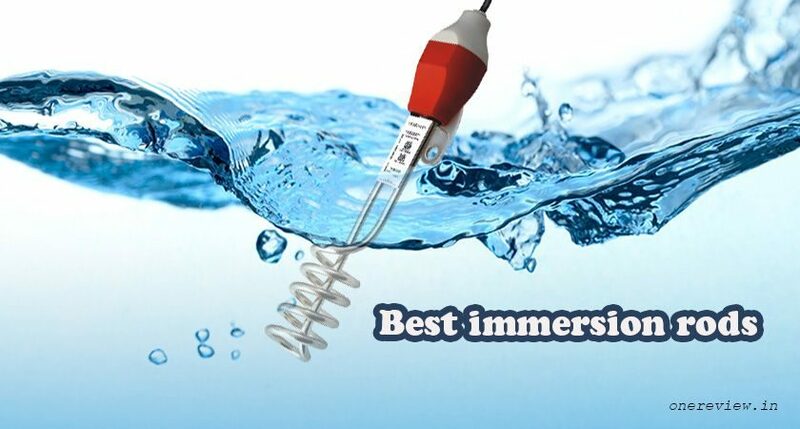 This immersion rod has a specially designed heating element that ensures quick heating of water within 10-15 minutes. Also, the bakelite cover ensuring complete protection against electric shock. This immersion rod from Crompton must be the best buy with all unique and safety features. With a power consumption of 1500 W, it efficiently heats water full of a bucket in a jiffy. And since it is very compact in size, you can easily store it in the drawer and cabinets without any hassle. There is a hook on one side of this immersion rod that lets you clip it in the bucket without dipping the rod fully in the water. Also, there is a water level mark on another side that helps you to put the rod exactly at the maximum level. This immersion water heater from Crompton is here to compete and win from the spine-chilling winters. It is also an economical solution for those who cannot spend much on getting an electric geyser. With a power consumption of 1000 W, it is specifically designed to meet the heating requirements of small to medium-sized families. This immersion rod includes the wire circuit that consumes less power and also saves energy. The metal coating of this corrosion free immersion water heater makes it free from rusting and also helps to heat quickly. This feature packed immersion rod is an economical product with the indicator to alert the user when the water gets heated. This immersion rod from Hytec is a must have product for your home to get instant hot water. It heats water quickly consuming 2000W and thus proving to be energy-efficient. It also facilitates optimum heat transfer for the enhanced performance. To get hot water, you just need to simply dip it in a bucket or tub of water and switch on the rod. This water heater ensures its durability because it is made from anti-corrosive plastic material and stainless steel. It is safe to use at home and even outdoors. Also, its heat-proof plastic handles offer you a comfortable grip during use. This is also one of the best immersion rods with a reasonable price out there. This immersion rod from Singer is perfect to get hot water within few minutes. It consumes 1500 W of power and also facilitates optimum heat transfer for enhanced performance. Equipped with safety features and ease of use, this one is a must-have appliance for all your water heating needs. This V-Guard immersion rod from the VIH series has an elegant, hairpin tubular design with a nickel plated copper tube for instant heating. It has a water level indicator as well as power indicator to enhance its functionality. This immersion rod is an economical product with a power consumption of 1500 W and thus proving energy-efficient too. Also, the safety features make it easy to use anytime whenever you need the hot water. With an economic and cost-effective option rather than geysers and water heaters, this is another smart choice for getting hot water in winters. This Eveready immersion rod comes with a stylish plastic body as well as a powerful heating element that makes the water heating a breeze. When it comes to quality, this one is absolutely a top-notch product. 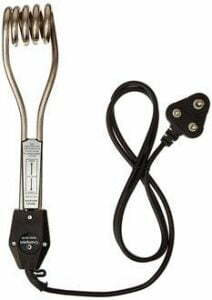 This immersion water heater with the power of 1500 W, heats a bucket full of water in no time, and also saves a great on your pocket while paying the electricity bills. This one also comes with the minimum and maximum water level, so makes it easy to fill the water accordingly. Also, its water resistant shock proof body makes the handling of it very easy. With its long cord, you can conveniently plug it into the nearest socket. This immersion water heater from the brand Bajaj comes the next in our list with awesome performance and safety features. It can be simply described as Quick, Fast, Shockproof, Compact, and Convenient. Its heatproof plastic handle provides you the comfortable grip while handling. It is made up of anti-corrosive plastic material and copper with nickel plating that makes this immersion rod a durable one. 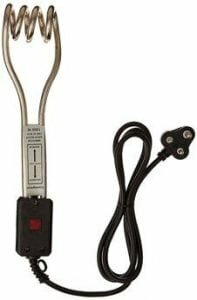 When it comes to power consumption, this 1500 W immersion heater proves to be more energy efficient and facilitates optimum heat transfer for enhanced performance. With great style and appealing design, this immersion water heater from Starvin fulfills all your water heating needs in a simple way. It has been certified by ISI Mark that ensures it is the superior quality product. It comes with the copper element coated with nickel plating that makes it even more durable. This immersion rod has a compact design making it easy to carry around. Equipped with heat-proof plastic handles, this rod offers you a comfortable and firm grip during use. This immersion heater also has a hook to tie at the edge of the bucket while heating water. So, enjoy a warm water bath in the winters very effortlessly with this immersion water heater. This is all about the latest and best-selling immersion rods or immersion water heaters to get the instant hot water for all your water related needs. Whether you want hot water to freshen up at the end of the day, or wish to have a bath in the morning, all the above-mentioned immersion rods will help you beat the awkward cold each time. All these immersion rods are also available at pocket-friendly prices that take care of the pocket of the mediocre man. So pick the best one right now.